We are endotherms (warm-blooded animals) and must maintain a nearly constant temperature (~37C) of blood circulating to the vital organs like brain, heart, liver and kidneys. The skin, from where most of the heat loss happens, is held at 33C to 34C. Heatstroke is defined as blood temperature above 40C; it is dangerous and if left untreated then serious damage to major organs can happen or even death is likely. Consumption of 2000 Calories per day produces energy at the rate of ~100 W. The body's thermal regulation mechanism easily gets rid of this heat energy if the ambient temperature is around 23C - the main mechanism is heat loss by radiation (~65%). Most of remaining energy is lost by convection (~12%), evaporation (~12%) and respiration (13%). The question we address in this blog is what happens when the ambient temperature is higher. Thermal Regulation Mechanism: The hypothalamus in the brain regulates the core body temperature around 37C mark. It senses the circulating blood temperature in the brain and using similar data from skin sensors monitoring external environment, the hypothalamus operates like a thermostat in a negative feedback loop to maintain a nearly constant value around the set point of 37C (homeostatis - status quo). In negative feedback, a deviation from the set point automatically starts a corrective mechanism that reverses the original change and pushes the system back towards the set point. The action of the hypothalamus is involuntary and happens automatically. In addition, humans can act to change the environmental effects by voluntary action such as cooling the body by moving into shade, wearing lighter cotton clothes, increase intake of water or even stretching out to increase surface area for heat loss. 1. Sweat Glands: secrete sweat on the surface of the skin where the water evaporates using heat energy from the body. Since water has a large value of heat of evaporation (2260 J/gm), it is very efficient in cooling the skin. 2. Smooth Muscles: relax to allow greater blood flow. This transports more heat to the skin allowing it to be lost by convection and by radiation (if the outside temperature is less than 33C). Skin appears more red due to increased blood flow. 3. Erector Pili Muscles: muscles relax to flatten the skin hair, allowing better air circulation over the skin which increases heat loss by convection and evaporation. 4. Adrenal and Thyroid Glands: Glands stop secreting adrenaline and thyroxine. Metabolic activity is slowed down to generate less heat energy in the body. As ambient temperatures increase towards the skin temperature, loss of heat by radiation is reduced and the body relies more on sweating and evaporation for losing heat. Prolonged exposure to high temperatures or physical exertion can cause heat exhaustion. Left untreated, heat exhaustion can quickly lead to heatstroke - a potentially deadly condition. Heat Exhaustion: The symptoms of heat exhaustion include muscle cramps, heavy sweating, weakness, fast heart rate, nausea and pale/cool skin. To treat heat exhaustion, move to a cooler location, sip water, cool body by applying wet cloth. Heatstrokes: is defined as a core body temperature of 40+C. The fever is accompanied by confusion, headache, rapid breathing, lack of sweating, nausea/vomiting, muscle cramps, weakness. There is dysfunction of the central nervous system resulting in symptoms such as fainting/unconsciousness or seizures. Lack of sweating also means that the body can not use the two most effective means of losing heat energy viz. radiation and evaporation. Heatstroke is a serious condition and must be treated as an emergency. With global-warming (leading to many more extremely hot days - more countries are reporting record high temperatures of 47 C or even 50+C), greater urbanization (heat-island effect), rise in obesity and an aging population (less robust), heat related incidences are on the rise. In India, 2500 heatstroke deaths per year are reported and represent a 61% increase in 10 years. Following the 1995 Chicago heat wave, half of the patients admitted to intensive care unit died within a year. Many experienced severe functional impairment after discharge - with no recovery reported. The Physics of Heat Loss from the Skin: I would now look at the physics of heat loss and heat gain by the skin. The three main mechanisms are radiation, convection and evaporation or vaporization (sweating). Negative energy loss means that skin is absorbing heat energy from the environment. If you are outdoors in the Sun, then you actually receive extra energy from direct sunlight. On a bright day this can be as much as 250 W. So, on a hot day at 40C, one can be absorbing up to 300 W energy. This can result in a sun stroke (same as a heatstroke but can come on quickly due to exposure to direct Sun). Skin can get very hot locally and cause sunburns. Physical activity like sports will produce even more energy. On such hot days, it would be better to stay in shade or indoors and avoid strenuous activity. 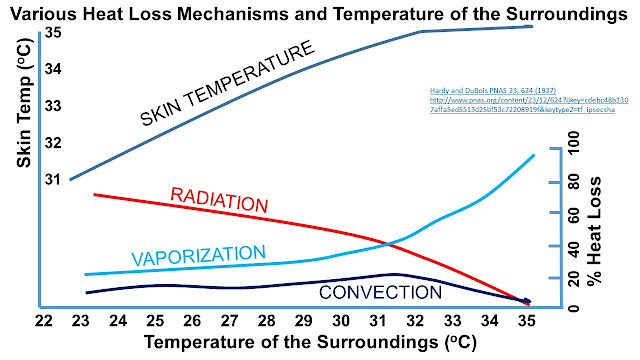 Radiation loss is an effective heat loss mechanism only if ambient temperatures are less than 30C. Convection: is transfer of heat between our skin and the surrounding air. How much heat energy is lost from the skin depends on the temperature difference between skin and air and strongly depends on whether the air is still or moving. K is convection coefficient and depends strongly on the speed of air - the largest difference being between still air and moving air. The way it works is that our body warms a thin layer of air on the skin. This boundary layer acts as an efficient insulation reducing heat loss. In convection, wind blows this boundary layer away and heat from the skin creates another boundary layer. As wind continues to blow away such boundary layers, body looses heat energy and cools. For a 5 degree difference in temperature, power loss is about 20 W in still air, but increases to 200 W in moving air! Convection is a very efficient method of heat transfer when you are standing in front of a fan. If the surrounding air temperature is 35C or greater, then heat is actually transferred to the skin and the evaporation of sweat will need to be increased to compensate this. It is best to stay out of the wind on hot days as convection is ineffective in cooling the body. Evaporation: Sweat brings saline water to the skin, and forms a thin damp layer. The water in the sweat evaporates to cool the body. 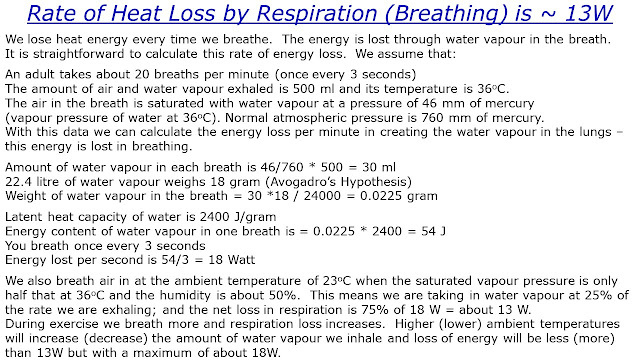 Water has a high value of latent heat of vaporisation - it takes 2260 Joules of energy to evaporate 1 gram of water. This energy is drawn from the skin which cools as water evaporates. Humans sweat a maximum of about 0.7 to 1.5 liters per hour - approximately 0.2 to 0.45 g per second. If this water evaporates, then body will lose heat at the rate of 500 to 1000 W. This is a large amount of energy loss and is very effective in keeping the body cool as the ambient temperature rises beyond 33C when radiative and convective cooling becomes ineffective. Evaporative loss is independent of ambient temperature and depends only on the amount of water that vaporizes. Water is evaporated from the skin more efficiently when the air is dry and holds only a small quantity of water vapour. On a hot and humid day, when the air might be nearly water-saturated, evaporation from the skin becomes less efficient and the heat loss is reduced. The result is that the body retains more heat being unable to vaporize all of the sweat. More sweat on the skin gives a clammy and uncomfortable feel. The skin temperature also rises towards 35C. The following slides represents the situation - I have redrawn the slide from the paper by Hardy and DuBois. On hot days with ambient temperature exceeding 40C, the water loss from evaporation must be compensated by drinking more water. If ambient temperature rises much higher - to say 47 or 50C - then evaporative loss may not be sufficient to keep the body core temperature below 40C and that is when the danger of heatstroke becomes serious. Hypothalamus starts to mysfunction and sweating can actually reduce or even stop - this a dangerous signal and urgent action is required. End note: The body can and does change set point from its normal value of 37.5C in the special situation when a more intense response is required to fight infections and/or increase the efficacy of the immune system. In such situations, chemicals called pyrogens are released by white blood cells. Pyrogens raise the set point of the thermoregulatory centre by a couple of degrees. Hypothalamus then tries to maintain the core body temperature at a higher level that helps to kill bacteria, inhibit viruses - effectively fight pathogens. The body at a higher temperature loses more heat and shivers to generate extra energy. Maintaining higher body set point over long periods can be harmful to organs and there is an interesting ongoing debate whether one should reduce the fever by using medication (paracetamol or ibuprofen) or let the fever ride. The topic is somewhat outside the scope this blog but you can follow the reference cited here for details.